The general purpose of Ohio’s Workers’ Compensation System is to provide statutory benefits to compensate employees for work-related injuries or diseases. The payment of benefits is tied directly to medical costs and indemnification for lost work time. Because workers’ compensation is a no fault system, questions as to how or why an employee was injured usually are irrelevant. In addition to the normal workers’ compensation benefits, the Ohio Constitution provides for an additional award paid by the employer to the injured worker where the employer committed a violation of a specific safety requirement (VSSR). In essence, a VSSR award is a fault-based penalty assessed against the employer. Whenever a workplace injury occurs, Ohio employers must be aware of the potential for VSSR exposure. VSSR awards can be very costly for Ohio employers. Depending on the severity of the safety violation and any mitigation or aggravating factors, the Industrial Commission has the discretion of issuing a VSSR award amounting to between 15% and 50% of all compensation paid to the injured worker in the accompanying workers’ compensation claim, calculated up to the maximum weekly compensation rate set for the year of injury (currently $885). For example, if the injury occurred in 2016, and before returning to work, the injured worker received 52 weeks of temporary total disability compensation at the maximum weekly rate ($46,020), and a permanent partial disability award of 25% ($14,750), a VSSR award would be between 15% ($9,115.50) and 50% ($30,385) of the total paid compensation. The award also could include an amount to account for future compensation paid in the claim. The Industrial Commission exercises considerable discretion in determining the size of the award. Moreover, an employer who commits two or more VSSRs within a 24-month period is subject to an additional penalty of up to $50,000 for each violation. A claimant has two years from the date of occupational injury, disease or death to file a VSSR application. As a prerequisite to filing the VSSR application, the employee must have a workers’ compensation claim for the same injury. Once the VSSR application is filed, the employer has 30 days in which to file an answer. If the application and answer is not determinative, the matter is referred to the Bureau of Workers’ Compensation where the Safety Violations Investigation Unit conducts an investigation and issues a Report of Investigation. It is advisable that employers have an attorney present to protect their legal interests during the on-site investigation. Throughout the investigation process, the parties are encouraged to negotiate a settlement. If the parties cannot reach a settlement agreement, the matter is set for a preconference hearing with the Industrial Commission and then a merit hearing before a staff hearing officer. To establish VSSR liability, the injured worker has the burden of proving: (1) a specific safety requirement, applicable to the employer at the time of the injury; (2) the employer, with control over the circumstances leading to the injury, violated the specific safety requirement; and (3) the employer’s violation proximately caused the injury, disease or death. Unlike in the workers’ compensation context where statutes are liberally construed in favor of the employee, VSSR standards are strictly construed with all reasonable doubts resolved in the employer’s favor. 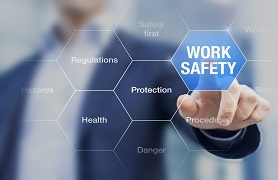 The rule of strict construction provides that all reasonable doubts concerning the interpretation of a safety requirement must be resolved in the employer’s favor. This rule places a high burden on an injured worker alleging a violation and provide employers with the opportunity to craft various legal arguments against a provision’s applicability. Because VSSRs are considered a penalty, safety requirements must be specific enough to plainly apprise an employer of its legal obligations towards its employees. Therefore, lack of specificity is a valid defense if the alleged VSSR contains an arguably ambiguous statutory term. Perhaps the most contested VSSR issue is determining the applicability of the alleged safety requirement. The majority of VSSR awards are based on a violation of a safety requirement found in the Ohio Administrative Code. When defending a VSSR, it is important to have a thorough understanding of how the Ohio Administrative Code is organized, as certain safety requirements apply only to designated industries. In many instances, an employer can successfully defend a VSSR on a procedural basis without having to argue the merits of the alleged violation. Although VSSRs can be a frightening reality for Ohio employers, especially considering the potential for steep out-of-pocket cash liability, the majority of VSSRs are defensible or at least manageable with the assistance of effective legal counsel. If you are faced with a VSSR, do not hesitate to seek immediate legal assistance to guide you through the investigation, negotiation and hearing process. Should you have any questions regarding VSSRs, please contact either Mark A. Shaw or Melissa A. Ebel. Disclaimer: The article in this publication has been prepared by Eastman & Smith Ltd. for informational purposes only and should not be considered legal advice. This information is not intended to create, and receipt of it does not constitute, an attorney/client relationship.